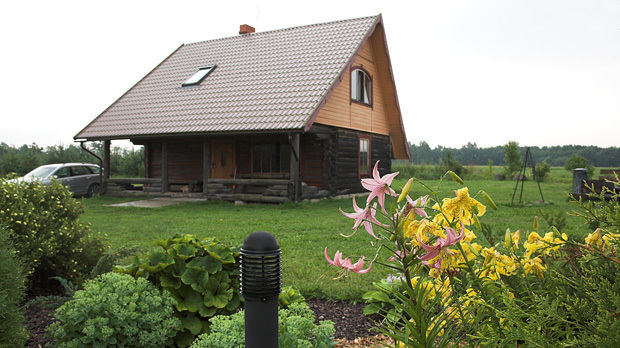 Over the course of time, the newer of two guesthouses at Ezermaļi campsite was christened “the New House” and built from logs. There are two bedrooms on the attic floor of “the New House”, each of which can accommodate two people. Each room has access to its own shower and toilet. There’s a large reception room on the ground floor with a fireplace and kitchen. This room also contains a large wooden table with benches, soft sofa, music centre and large LCD television. The kitchen has everything you need to feel at home: water, a ceramic cooker, microwave oven, electric kettle, fridge, as well as plates and cutlery. And the sauna section on the ground floor of the guesthouse contains a separate toilet, shower and changing room. It took the author of this article something like 1.5 to 2 hours and two “ovens” full of lumber to heat up the sauna to a feel good temperature of some 80°C. The intensity at which you heat the sauna will depend on the number of people who are going to use it. The greater the number of sauna goers, the most intensively you should heat the sauna to maintain the desired temperature. You will find valuable sauna accessories like salt, honey and fresh birch brushes in the sauna. The sauna stones have a pleasant effect in releasing quite a lot of steam after you toss some vapour onto them. The upper stones don’t get overly hot and the water you pour on will take quite a long time evaporating at the bottom of the pile of stones. The outcome is a memorable experience characterised by rich and enduring steam, excellent perspiration and swatting oneself vigorously with a birch besom in the time honoured manner. If you book his services well in advance, you can hire a high class sauna attendant from Saka who will arrive at the sauna with several types of brooms, herbal teas and other sauna accessories to make sure you enjoy a wonderful sauna ritual. You can park your car right next to the guesthouse. Nearby, you’ll find a campfire spot and barbeque grill right outside the house. The guesthouse has two bedrooms – one on the eastern and the other on the western side of the house. The windows in one bedroom face eastwards meaning that the morning sun will greet those among you who like to get up early. This room also has a skylight and beds positioned from south to north. Those who like a lie in of a morning will prefer the other bedroom whose windows face west. This bedroom is slightly bigger and the beds are positioned from east to west. Both bedrooms are decorated in light tones with furniture made from natural wood. Each bedroom has its own toilet and shower. Wooden stairs on the inside of the house lead to the bedrooms. A covered terrace with a table and benches is located by the entrance to the guesthouse. From the terrace, you’ll enjoy a broad view of Lake Zvirgzdu and the surrounding countryside. Around midsummer, the air is rich with the scent of freshly mown hay and the fields are punctuated by rolls of hay. You will find a swimming spot 50 metres from the guesthouse with a wooden walkway and boat dock. A second swimming spot is located a little further away. Both swimming spots have clean and sandy water beds. The rate on Fridays, Saturdays and Sundays for the whole guesthouse (four people), including the sauna is Ls 80. On weekdays the rate is Ls 60. If only two people are staying at the guesthouse, then the rates for the use of the guesthouse and one bedroom are Ls 40 / Ls 30 respectively. The price includes use of the kitchen and sauna, as well as bed linen and towels for two. For longer stays, guests can reach a friendly agreement with the landlady of the Ezermaļi campsite. Reservations for the guesthouse should be made in advance, particularly if you’re planning to visit on a weekend.